It is not often you'll see me in a pair of white bottoms or even white jeans for that matter. I'm either; way too conscious I'm going to spill everything and anything down myself, or way too self conscious you can see everything and anything.. I thought it was about time I ditched my usual cropped flares I've been sporting of late, put down my black denim skinnies and embraced the white flare! 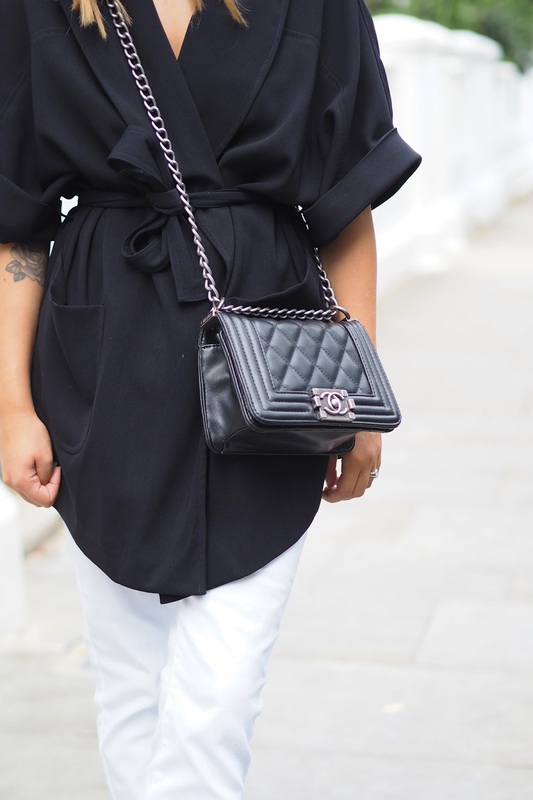 I find wearing something oversized like a belted kimono or something with a slight bit of length like a maxi cardigan really pulls the outfit together and makes it more "me"
What I'm Wearing: River Island Kimono, Missguided Flares, Public Desire Heels, Asos Sunglasses and Chanel Bag. such a stunning look, that kimono makes it so stylish! Ahh Hannah you look amazing!! I LOVE those flares so much!